HUNTERSVILLE, North Carolina (Nov. 13, 2018) – The current elimination format of the Monster Energy NASCAR Cup Series playoffs is down to the final weekend of its fifth season, and one thing has been clear during the format’s first four seasons of finales – it truly is winner take all. The good news for Kyle Busch, driver of the No. 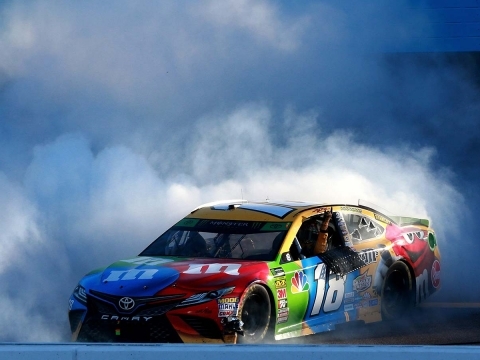 18 M&M’S Toyota for Joe Gibbs Racing (JGR), is he’s not only visited victory lane eight times this season to tie his career high, he performed that same feat in 2015 when he won the 400-mile season finale at Homestead-Miami Speedway to bring home his first Cup Series championship. While the rules state that Sunday’s highest-finisher among the four championship-eligible drivers at Homestead will win this year’s title, it’s been proven thus far it’s about more than simply being the highest finisher, it’s a must-win situation. Martin Truex Jr., was the latest to win the finale at Homestead last season to clinch his first career championship. In 2015, winning was also a necessity for Busch to bring home his first title as another Championship 4 driver, Kevin Harvick, was right behind him in the runner-up spot. Last season, the winner-take-all scenario rang true as, right behind the victorious Truex was fellow Championship 4 contender Busch in the runner-up spot. The road to Homestead for Busch and the M&M’S team has highlighted a career year for Busch. While this is the fourth consecutive season Busch has made it to the Championship 4, his path in 2018 proved to be much different than the previous three seasons. In 2015, Busch’s path was paved with six top-five finishes and seven top-10s in the 10 playoff races, his lone win coming in the championship race at Homestead. During last season’s 10-race playoffs, Busch made it through to Homestead with victories at New Hampshire Motor Speedway in Loudon, Dover (Del.) International Speedway and Martinsville (Va.) Speedway. Busch has two wins, four top-fives and six top-10s in this year’s nine playoff races, and he knows he’ll likely need to find one more victory in order to become the 2018 Cup Series champion and bring home his second title. There have been 15 NASCAR Cup Series drivers who have won two or more championships since the sport was founded in 1959. Busch is hoping to become the 16th this season to go with his first title in 2015. Busch also knows the task of winning at Homestead is a big one as he’ll compete against former champions Harvick and Truex, along with former teammate Joey Logano. It’s perhaps the strongest Championship 4 field in history, one that will vie for the title in the one-race shootout for the Cup Series championship trophy Sunday afternoon in South Florida. 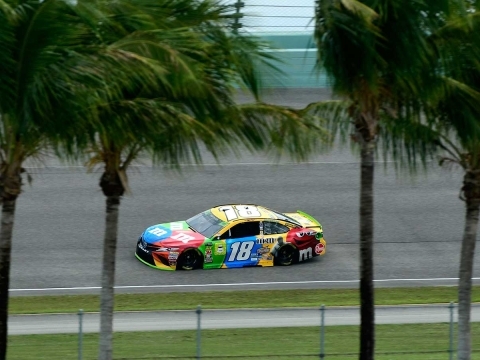 While Busch’s statistics at Homestead, where he has an average finish of 18.5, may not be his best, they certainly aren’t indicative of how he can run at the 1.5-mile oval. Busch dominated the 267-lap season finale in 2012, leading six times for a race-high 191 laps. But while he had the dominant car, the Las Vegas native had to settle for a fourth-place finish after a long, green-flag run to the checkered flag, the M&M’S team come up short on fuel and a seemingly certain win was foiled in the closing laps. He backed up his strong run from 2012 with an eighth-place finish in 2013 and had a strong run going in 2014 before a driveline issue put him in the garage for several laps, foiling another chance at the win. Busch’s most impressive race at Homestead came in 2015, when he had the top championship-eligible car for much of the 400-mile race, leading six times for a total of 41 laps and bringing home the win and the championship. So, as Busch heads to South Florida with everything on the line Sunday, the M&M’S driver has the mindset that it’s a must-win situation in order to guarantee a second Cup Series championship. How much weight do you put on momentum and the battle coming up at Homestead? Are there any clear favorites among the Championship 4? How big is it to have a chance to win another championship? How does it feel to be able to go and race for a championship at Homestead for a fourth year in a row? “It’s obviously a great opportunity to be able to go race for a championship, and that’s what this format is. It doesn’t mean a whole lot to make it to the Championship 4 if you don’t win it. You know, it’s all reset to zero. There are four of us who go for winner-take-all at Homestead. It means a lot to have that opportunity, not only for myself, but for M&M’S, Toyota, Interstate Batteries and everyone at JGR who helps us to be as good as we’ve been. It’s what your whole season comes down to. I’m looking forward to Homestead and we’ll see if we can bring home another championship. From your recent experience, how has Homestead changed over the last several years?